Stars in your Eyes (with a little eye test)! Extravagant, shimmering cut glass was very fashionable in the 1800s. One English firm alone (Stevens & Williams) recorded over a thousand cut glass designs in their pattern books! Later, in 1876, Brilliant Cut Glass was introduced to America - it was even more scintillating with its geometric designs that sparkled like diamonds. But it was expensive to make … and expensive to buy. Subsequently it was imitated by (cheaper) press moulded designs, which as the Carnival Glass makers were quick to realise, had intricate surfaces that were ideal for showing off their iridescent effects. So, it wasn't surprising that many of their pressed glass patterns adopted cut glass motifs, and especially star designs: whirling stars, pinwheels, hobstars! ​But do you know what kinds of stars they all are? Can you tell a hobstar from a buzzstar? We did all the hard work for you and narrowed the stars down to four main types. The first three are found on the geometric style designs (that imitate cut glass). The fourth kind of star has a free style and looks hand drawn (not geometric). The three basic, geometric star motifs are simple stars, whirling stars and hobstars. The simple star is the kind you see on the underside of the marie (base) of many Carnival pieces, such as the Asters piece below. It is sometimes described as a many-petalled flower motif. The exterior and base of Brockwitz's Asters. On Cambridge’s Double Star pattern (above), the large star on the pitcher is an excellent example of a whirling star. But the two tumblers on each side of the pitcher show the other pattern element, hobstars. Here are some freehand stars on a Karhula Nightwish bonbonniere. ​They look as if they have been “piped” on like cake frosting. And then there are the freehand stars that don’t imitate cut glass – Millersburg used a variety of them on patterns such as Many Stars, Little Stars and Night Stars. ​The Stars that became a Crown - Spotlight on the “Imperial Crown” (Royalty) design and the first ad for Carnival Glass. Take four large hobstars, cleverly intersperse them with diamond motifs, and you have a crown! Imperial were undoubtedly masters of pressed glass designs that looked like cut glass. They were so very proud of one of their first patterns, it was even given a name and patented. The “Imperial Crown” design (known to Carnival collectors as “Royalty”) emerged in the early years of Imperial’s production. In 1906 it was registered as a patent design and was heavily promoted in the trade press. ​Imperial had a very good reputation as a producer of imitation cut glass (i.e. pressed to look like cut glass). The following is a quote from the 1906 American Pottery Gazette in an article on the rise of pressed glass. 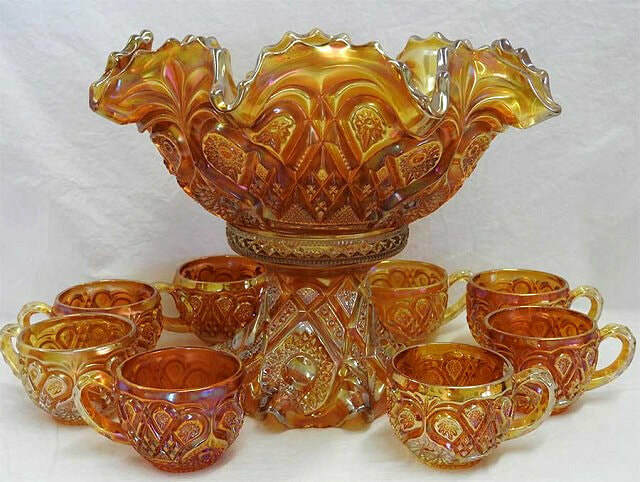 “Of the new designs just come upon the market one of the most striking, because of its richness in decorative effect and exceedingly clever workmanship, is known as the “Imperial Crown” pressed ware, made by the Imperial Glass Company of Bellaire, Ohio. This glass must actually be handled before it is possible to determine that it is really only a piece of pressed ware. It has the sparkle, the life, the brilliancy and almost the sharpness of cut glass”. 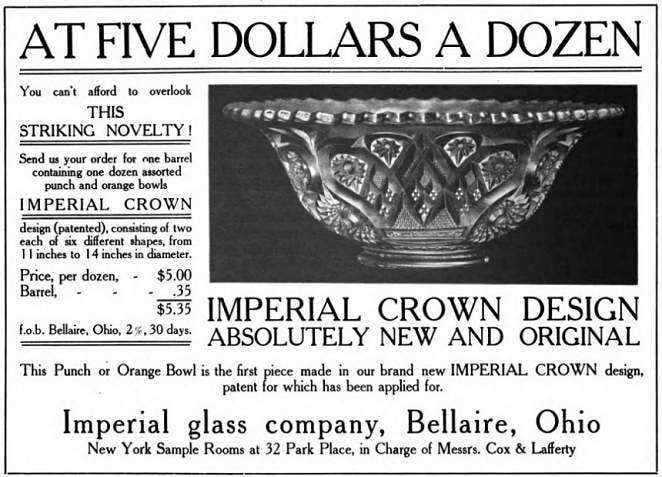 ​Initially made in crystal, the Imperial Crown design was also produced in Carnival, and it had the distinction of being featured in what we believe was the very first ad for Carnival Glass in the newspapers in July 1908 (right). Although described as “plates” these were clearly bowls. Note the colour is described as “iridescent” and “rubi color”. This would, of course, be marigold (Imperial’s rubigold). Although Imperial marketed these large items as punch bowls as well as fruit bowls, they did not make a matching base. Instead they used the base to the Fashion punch set, and even illustrated the Imperial Crown (Royalty) punch bowl on top of a Fashion base, in their catalogues. ​​The Curved Star mystery – who made it? The Curved Star pattern was made in Carnival by three European makers … but each of their versions is slightly different. But here’s the good news! Almost all the examples of Curved Star you’re likely to come across were made by Brockwitz in Germany. (The other two makers of the pattern were in the Nordic countries: Eda in Sweden and Karhula in Finland. Examples from these two makers are few and far between and are very seldom seen). Brockwitz made a very wide range of shapes in the Curved Star pattern. Some of them have a different pattern name, which was given to them decades ago by Carnival collectors who didn’t realise they were part of Brockwitz Curved Star range. ​The "Cathedral Chalice" is actually the Curved Star pattern. ​The shape shown on the left was called “Cathedral Chalice” for many years, yet it’s actually part of Brockwitz Curved Star range. In fact they were originally intended to be used at the dining table, for washing grapes in, or as celery vases. And here’s a jardiniere - the pattern is known as “Superstar” but again, this was part of Brockwitz’ Curved Star range! Plus a vase that was called “Star & Fan” … and yes, you’ve guessed, it’s also part of Brockwitz’s Curved Star range. How do you spot the difference between the three makers’ versions of Curved Star? It’s all in the *file*. On the Brockwitz version (A) the claw shapes are filled with a criss-cross file pattern, as is the lower diamond shape in the centre – also, the diamonds at the end of the claws are filled with a star motif. Eda’s version (B) is distinguished by no file on the claws and central lower diamond, but it does have star motifs in the diamonds at the tail of the claws. The distinguishing features of Karhula’s version (C): no file on the claws and the central diamond and no star motifs in the diamonds at the end of the claws. Did you know that there are stars on the Rose Garden pattern? ​​Large hobstars flank the rose on the oval (letter shape) vase. Both Brockwitz (Germany) ​and Eda (Sweden) made their versions of the vase in this pattern. ​And ... who knew that there was a very fine, cut glass (crystal) version of this Rose Garden vase? ​We were astonished when we stumbled across the vase shown on the far right, in a 1930 catalogue of fine, hand-cut crystal glass, made by the Finnish glass company, Riihimaki. It was clearly a copy of the Brockwitz and Eda pressed glass versions of the vase – and it was made later, in 1930. Brockwitz were making theirs from around 1915 or earlier, and Eda’s version was shown in a 1925 catalogue. There are slight variations in the way the pattern was interpreted and portrayed on the cut glass version – no doubt to accommodate the different techniques involved in glass cutting. ​​Immediate right: Pressed glass version by Brockwitz, Germany. Far right: Cut glass version by Riihimaki, Finland. 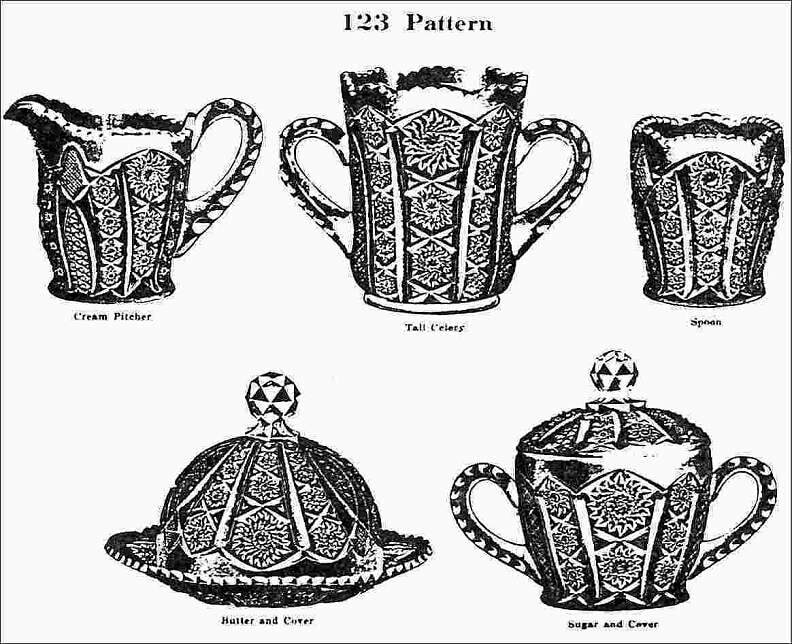 In its early days, just over a century ago, Indiana Glass made a range of glass that they called their “123 Pattern” (see Indiana Glass Co. catalogue extract on the right from c. 1910). Later collectors called it Panelled Daisy & Fine Cut, and it was shown in a number of Butler Brothers catalogues from around 1910. Fast forward to the 1970s and Indiana decided to use the pattern again, but they gave it a new “look” by making it in Carnival Glass. And we know it today as the “Heirloom Series”. The 1970s version of this pattern (Indiana’s Heirloom Series) can be seen in its original catalogue illustrations, in the Contemporary Carnival section of our website. Be sure to check out both pages! ​and also Indiana Heirloom Red. Indiana "123 Pattern" c.1910. Made in Contemporary Carnival in the 1970s. In June 2018 this beautiful vase (on the right) was posted on our Carnival Glass NetworK Facebook Group page. What was it and who made it? Fortunately, we were able to provide the answer and also give a catalogue page and production line number. The vase is a Fenton bud vase called “Raspberry” (believed to have been made using an old Fostoria mould). It was in the Fenton line from June 2007, as their #4268. The vase featured in a special 2007 Centenary Celebration Supplement from Fenton, an extract from which is shown far right. ​Thanks to permission from the Fenton Family and Fenton Art Glass, we are able to show you the full-page Supplement and more information on our website: Fenton's Centenary Celebration. ​Our very active and lively Carnival Glass “NetworK” Group on Facebook continues to grow. Over the last month the posts, comments and reactions totalled over 39,000 - that is an astonishing number! It shows the huge amount of member activity that takes place in the Group. Carnival is shown and admired, questions are answered, topics are discussed. Often, items requesting an ID are answered within a few minutes. We all learn from each other. No question is too simple or too complex and all kinds of Carnival Glass are welcomed and featured. (The picture on the left is a screen shot from our Facebook Group’s stats on June 25th). ​Why not join in the fun, and maybe also invite your friends to join us all here: NetworK's very active Facebook Group. We invite you and your friends to join us all on NetworK's fast growing and very active Facebook Group (link is below), and if you have missed any of the previous issues of NetworK and NetworK Specials, they are all here: Back Issues.